1 of 4 Heat oven to 200 degrees . In a large bowl, whisk together lemon juice, oil and 1/4 tsp of the salt. Add frisee to bowl and gently toss. Set aside in refrigerator. 2 of 4 In a shallow dish, combine flour with remaining 3/4 tsp salt and the pepper. Beat eggs in a separate dish with 1 tbsp water. Pour bread crumbs into another dish. 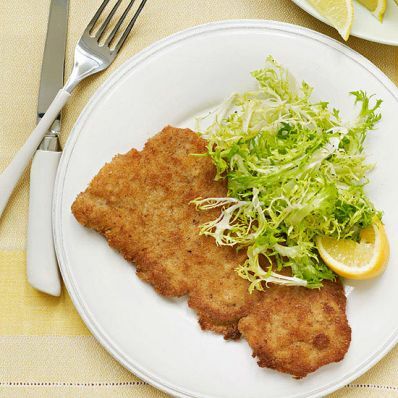 Coat a veal cutlet in flour, then dip into egg mixture, allowing excess to drip off. Finally, coat cutlet in bread crumbs. Set aside on a plate. Repeat with remaining veal cutlets. 3 of 4 Heat 2 tbsp of the butter in a large nonstick skillet over medium-high heat. Add a few of the veal cutlets, being sure not to crowd skillet. (Cooking should be done in 3 batches.) Cook 2 minutes; flip and cook another 2 minutes, until veal is golden brown. Transfer to a baking sheet and place in 200 degrees oven. Repeat with remaining cutlets 2 more times, adding 1 tbsp of the butter for each remaining batch. 4 of 4 Serve frisee over cutlets. Garnish with lemon wedges. Per Serving: 600 mg sodium, 32 g pro., 8 g fiber, 27 g Fat, total, 468 kcal cal., 27 g carb., 12 g sat. fat, 229 mg chol.